Please open at least one store in the Los Angeles area. Preferably in Hollywood or the east San Fernando Valley, but hey, anywhere would be fine. It doesn't make much sense to me, especially considering how prevalent Baskin-Robbins and Togo's are in the region. All three are under the same brand! Sure, Starbucks may be a bit intimidating. Yes, we have them on practically every street corner and even multiple locations in single shopping centers. However, in light of lean economic times and factoring in the vast number of unemployed entertainment folks that live in L.A., I personally think you'd do a fine business. Good coffee for a low price. I'm sure my letter will be treated like others before mine and I'll just be informed that you have no plans for expansion into the Southern California market. I'll just have to enjoy my fill during my brief time here on the East Coast. P.S. Please don't tell me to just buy your coffee and make it at home. I can't make a good pot of coffee to save my life, even if I use your brand. we have dd here in wiiiiiiiiiilmingtooonn......if you come visit...i will buy you a cup. however, you'd end up preferring our local chain, port city java,,,,,,,wilmington is port city. Ha, that's funny. I'm here in Thailand and I can think of three of them that are within scootering distance any time I like. Baskin Robbins & Swensen's are also big here! I don't think they even have Swensen's in LA anymore!? Hmmm... maybe I'll just roll o over and see about getting me a old fashined or a crumb? What is it with people saying that they like Dunkin' Donuts coffee when they don't have access to it? Seriously, spend three or four months with it at ready reach and you'll be gagging for a cup of something that's not made through a strained sock. I won't be making it to NC orThailand (darn! 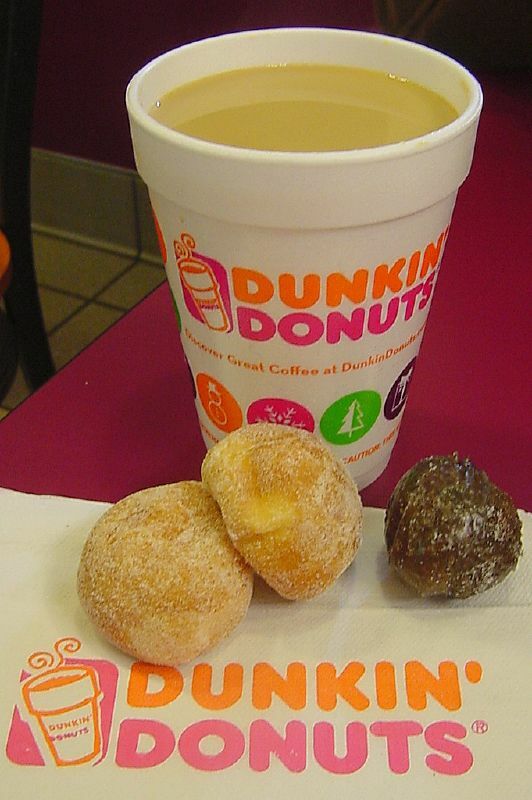 )anytime soon, but I do hear there may be a last remaining SoCal Dunkin' Donuts in San Diego. I have to check on that though. Kevin...you crack me up, but seriously, if you tasted my coffee you'd crave something strained through a sock (even a dirty one) too. Hm. Is it that good? We used to have them here in L.A. as kids, from what I remember, it wasn't all that. Well, I like the coffee. It's inexpensive and they add milk and (extra) sugar for you. Maybe I'm just cheap and lazy.